Rymer Omar Liriano was the first player from the Padres Dominican Academy to reach the majors with San Diego...Missed the entire 2016 season due to multiple facial fractures after being hit in face by a pitch in a Brewers spring training game on March 20 vs. the Dodgers. Split his season between Salt Lake (AAA) in the Angels' system and Colorado Springs (AAA), a Brewers affiliate...Hit a career-high 20 homers and drove in 59 runs in 102 games...Batted .253 (89-352). Returned to action in 2017 in White Sox system after missing all of 2016 with multiple face fractures...Claimed off waivers from Milwaukee on Oct. 28, 2016...Spent majority of season with Triple-A Charlotte slashing to .256/.323/.416...Set career bests in home runs (17)...Called up to big league club in Sept. and appeared in 21 games with White Sox...Connected for second MLB HR on Sept. 4 vs. Cleveland off Trevor Bauer. Was traded by San Diego to Milwaukee in exchange for lefthander Trevor Seidenberger on 1/28.  Missed the entire season due to multiple facial fractures suffered after being hit in the face by a pitch in the Brewers spring training game on 3/20 vs. Los Angeles-NL.  Was placed on the disabled list on 3/25 and transferred to the 60-day disabled list on 4/2.  Played in 37 games for Licey in the Dominican Winter League, hitting .258 (31-120) with three doubles, two triples, one home run, 14 RBI and 18 runs scored. Batted .292 with 14 HR, 64 RBI and 18 stolen bases in 131 games at Triple-A El Paso during his final season in the Padres organization…Ranked among the Pacific Coast League leaders in runs (3rd, 85) and walks (T4th, 64)…Played for Licey in the Dominican Winter League (34g, .196, 3hr, 13rbi)…Was designated for assignment on 1/22/16…Was traded to Milwaukee in exchange for LHP Trevor Seidenberger on 1/28/16. Made his first Major League stint after he was recalled from Triple-A El Paso on 8/11…made his Big League debut that night vs. COL, getting the start in right field, batting seventh...Was the third player in Padres franchise history to have a sac fly in his first career game, joining Joe Lansford on 7/31/82 (2) and Tony Gwynn on 7/19/82...Belted his first career home run with a solo shot into the third deck of the Western Metal Supply Building on 8/13 vs. COL…measured at 427 feet, it was the 14th home run hit to that location of Petco Park since the building opened in 2004 and the eighth time the feat was accomplished by a Padres player...Hit .291/.362/.473 (126-for-433) with 31 doubles, three triples, 14 home runs and 66 RBI in 115 games between Double-A San Antonio (99 games) and Triple-A El Paso (16 games)…named a Texas League mid-season All-Star with San Antonio...The Dominican Republic native was the first player from the Padres Dominican Academy in San Cristobal, DR, which opened in 2008, to reach the Major Leagues with the Friars. Missed the entire season due to recovery from Tommy John surgery on his right elbow…played in the Dominican Winter League following the season...Surgery performed on February 20 by team physician Dr. Heinz Hoenecke...Played in four games during the Dominican Winter League, hitting .111 (1-for-9) with a solo home run. Combined to hit .280 (130-for-465) with 32 doubles, four triples, eight home runs, 61 RBI, 65 runs scored and 32 stolen bases in 127 games between Single-A Lake Elsinore and Double-A San Antonio.Began the season with Lake Elsinore, hitting .298 (84-for-282) through 74 games for the Storm before earning apromotion to San Antonio.Hit .251 (46-for-183) with 15 extra-base hits in 53 games for the Missions.Was named a California League mid-season All-Star.Also selected to the World Roster of the 2012 All-Star Futures Game at Kauffman Stadium in Kansas City.Named the No. 3 prospect in the Padres organization by Baseball America prior to the start of the season.Was named the No. 6 prospect in the California League and the No. 10 prospect in the Texas League by Baseball America following the season.Participated in the Arizona Fall League after the regular season, hitting .319 (29-for-91) with five doubles, four homeruns, 15 RBI and 23 runs scored in 22 games. Split the season between Single-A Fort Wayne and Single-A Lake Elsinore, combining to appear in 131 games...Hit .298 (152-for-510) with 31 doubles, nine triples, 12 home runs, 68 RBI, 89 runs and 66 stolen bases between the two teams...Named the Midwest League's MVP and Prospect of the Year, Topps' Midwest League Player of the Year, a Low-A All-Star by Baseball America and a member of the ML post-season All-Star team...Ranked among ML leaders in stolen bases (2nd), batting average (3rd), hits (5th), triples (T-5th), runs (6th), total bases (6th), SLG (6th) and OBP (8th)...Named the Padres No. 3 prospect following the season by Baseball America. Played for three teams in the SD organization, splitting his time between Single-A affiliates in Eugene, Fort Wayne and Lake Elsinore...Combined to hit .231 (102-for-441) with 26 doubles, seven triples, three home runs, 38 RBI, 59 runs scored and 31 stolen bases...Rated as having the best outfield arm in the Padres organization following the season by Baseball America. Dominated AZL pitching, hitting .350 (69-for-197) with a .398 OBP and .523 SLG for the Peoria Padres. January 3, 2019 New York Mets signed free agent OF Rymer Liriano to a minor league contract and invited him to spring training. 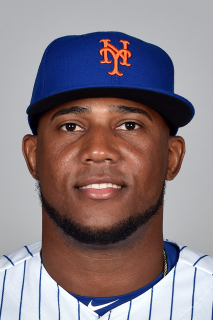 January 3, 2019 OF Rymer Liriano assigned to Syracuse Mets. December 30, 2018 OF Rymer Liriano assigned to Tigres del Licey. December 4, 2018 OF Rymer Liriano assigned to Navegantes del Magallanes. November 2, 2018 LF Rymer Liriano elected free agency. October 13, 2018 OF Rymer Liriano assigned to Tigres del Licey. October 13, 2018 Tigres del Licey placed OF Rymer Liriano on the reserve list. August 30, 2018 Rymer Liriano assigned to Colorado Springs Sky Sox from AZL Brewers. August 29, 2018 LF Rymer Liriano assigned to AZL Brewers from Colorado Springs Sky Sox. July 20, 2018 Milwaukee Brewers signed free agent RF Rymer Liriano to a minor league contract. July 20, 2018 LF Rymer Liriano assigned to Colorado Springs Sky Sox. July 9, 2018 Salt Lake Bees released RF Rymer Liriano. May 3, 2018 RF Rymer Liriano assigned to Colorado Springs Sky Sox. April 26, 2018 Salt Lake Bees activated RF Rymer Liriano from the 7-day disabled list. April 15, 2018 Salt Lake Bees placed RF Rymer Liriano on the 7-day disabled list retroactive to April 13, 2018. Rib contusion. February 6, 2018 RF Rymer Liriano assigned to Salt Lake Bees. December 12, 2017 Los Angeles Angels signed free agent RF Rymer Liriano to a minor league contract and invited him to spring training. October 9, 2017 RF Rymer Liriano elected free agency. October 4, 2017 Chicago White Sox sent RF Rymer Liriano outright to Charlotte Knights. September 2, 2017 Chicago White Sox selected the contract of RF Rymer Liriano from Charlotte Knights. April 15, 2017 Charlotte Knights activated RF Rymer Liriano from the 7-day disabled list. April 8, 2017 Charlotte Knights placed LF Rymer Liriano on the 7-day disabled list. April 1, 2017 LF Rymer Liriano assigned to Chicago White Sox. March 31, 2017 Chicago White Sox sent LF Rymer Liriano outright to Charlotte Knights. October 28, 2016 Chicago White Sox claimed Rymer Liriano off waivers from Milwaukee Brewers. January 28, 2016 San Diego Padres traded LF Rymer Liriano to Milwaukee Brewers for LHP Trevor Seidenberger. January 22, 2016 San Diego Padres designated LF Rymer Liriano for assignment. October 15, 2015 OF Rymer Liriano assigned to Tigres del Licey. October 5, 2015 San Diego Padres recalled LF Rymer Liriano from El Paso Chihuahuas. March 18, 2015 San Diego Padres optioned LF Rymer Liriano to El Paso Chihuahuas. December 26, 2014 OF Rymer Liriano assigned to Toros del Este. October 18, 2014 OF Rymer Liriano assigned to Tigres del Licey. October 18, 2014 OF Rymer Liriano roster status changed by Tigres del Licey. August 11, 2014 San Diego Padres recalled LF Rymer Liriano from El Paso Chihuahuas. July 23, 2014 LF Rymer Liriano assigned to El Paso Chihuahuas from San Antonio Missions. March 13, 2014 San Diego Padres optioned LF Rymer Liriano to San Antonio Missions. September 30, 2013 San Diego Padres recalled Rymer Liriano from San Antonio Missions. April 4, 2013 Rymer Liriano roster status changed by San Antonio Missions. March 10, 2013 San Diego Padres optioned RF Rymer Liriano to San Antonio Missions. November 20, 2012 OF Rymer Liriano assigned to Tigres del Licey. November 20, 2012 Rymer Liriano roster status changed by Tigres del Licey. October 4, 2012 San Diego Padres recalled Rymer Liriano from San Antonio Missions. July 9, 2012 Rymer Liriano roster status changed by San Antonio Missions. July 7, 2012 San Antonio Missions placed RF Rymer Liriano on the temporarily inactive list. June 28, 2012 RF Rymer Liriano assigned to San Antonio Missions from Lake Elsinore Storm. March 15, 2012 San Diego Padres optioned Rymer Liriano to Lake Elsinore Storm. November 18, 2011 San Diego Padres selected the contract of Rymer Liriano from Lake Elsinore Storm. October 14, 2011 OF Rymer Liriano assigned to Tigres del Licey. September 15, 2011 Rymer Liriano assigned to Lake Elsinore Storm from Fort Wayne TinCaps. April 25, 2011 Rymer Liriano assigned to Fort Wayne TinCaps from Lake Elsinore Storm. March 9, 2011 CF Rymer Liriano assigned to San Diego Padres. September 21, 2010 Rymer Liriano roster status changed by Lake Elsinore Storm. September 10, 2010 Lake Elsinore Storm placed CF Rymer Liriano on the 7-day disabled list. August 22, 2010 CF Rymer Liriano assigned to Lake Elsinore Storm from Eugene Emeralds. April 2, 2010 Rymer Liriano assigned to Fort Wayne TinCaps from AZL Padres. March 27, 2010 CF Rymer Liriano assigned to San Diego Padres. May 29, 2009 Rymer Liriano assigned to AZL Padres from DSL Padres. July 3, 2007 San Diego Padres signed free agent CF Rymer Liriano to a minor league contract.